Employment News, this week, has come up with ample of opportunities for govt job aspirants. With more than 500 vacancies announced in Indian Army, Banks, various Indian Ministries and other govt organizations, you have a greater probability of getting through any one of these. Indian Army has announced of 115 Tradesman vacancies, last date of which is 12 January 2017. Likewise 121 Chargeman post recruitment has begun at Indian Navy. 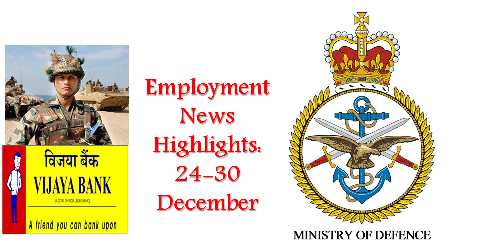 Defence sector has ruled over employment news this week by announcing more than 300 job vacancies. Ministry of Defence has sought applications from eligible candidates for the post of Clerks, JRF, RA, Stenographer, Multi Tasking Staff, Executive Engineer and other posts. A lucrative opportunity has come for candidates with postgraduate degree in Sanskrit, or any Jyotisha subject as Rashtriya Sanskrit Sansthan has announced for 29 teaching and administrative vacancies. Similarly 173 faculty posts are lying vacant at Hemvati Nandan Bahuguna Garhwal University. All the posts mentioned above have different eligibility criteria. Interested and eligible govt job aspirants are suggested to go through the details carefully, before applying.